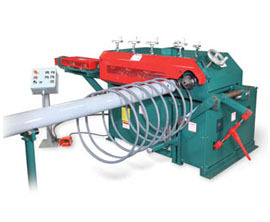 This machine is designed to spiral rebar without the need to prebend the leading end of the bar. It has a capacity of up to #7 (22mm) coiled rebar or wire. The 722HD has a variable frequency drive allowing operator to adjust the drive speed to a safe operating condition depending on bar size, spiral diameter, and pitch desired. The electronic counter allows you to preset the number of coils required. KRB SpiralMatic 722HD spiral machine complete with KRB heavy duty coil cradle will spiral rebar up to #7 (22mm) bar; grade 60 or 65kg/mm2.